While most of the girls in her small African village are thinking about boys and marriage, Auma dreams of winning a track scholarship and going to school to become a doctor. She ignores the boys to stay focused on her goals because she has seen too many girls get tied down with children and chores. She also sees that many more people than usual are dying and she hears whispers that they are dying from Slim, or, as her teacher calls it, AIDS. When her father comes home from his job in the city and begins to waste away, Auma wonders if he might have AIDS and what that means for her mother and their family's future. This book was a disappointment for me after I began it with high expectations. 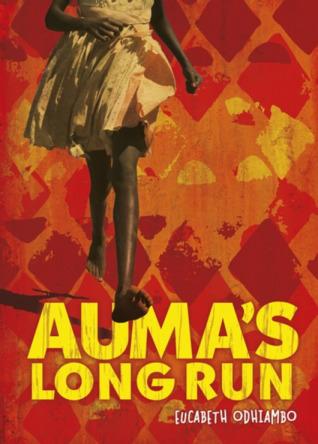 The beginning of the AIDS crisis and the misinformation that was everywhere at that time should have made for a compelling read, almost a mystery, as Auma worked to figure out what was happening and moved towards her goals. Instead, I felt like the book meandered around a slice of life rarely hitting the severity of the health crisis on the head. The basics were there - people believed that only dirty or bad people contracted the disease; infected men spread it to many other women thanks to local customs of acquiring widows; people didn't want to discuss the problem; and listed causes of death were wrong - but I never felt all those elements coming together to some undeniable truth. If I change my focus to just looking at the impact AIDS had on one person's life, then I can be more affected by the story and extrapolate out to how this must be the reality for any number of children and teens at that time. Unfortunately, I was looking for a more global view offering up condemnation for the way in which AIDS was ignored and the pain that denial brought.